November 30th - Jinkies! — This is Lit! We don’t know a kid who didn’t grow up watching Scooby-Doo. There was the leader, the smart one, the pretty one, and the one that ate everything…and the dog. Elizabeth constantly found herself associating with the smart one. Knee-high orange socks were never her thing though. This gang became part of our childhood. 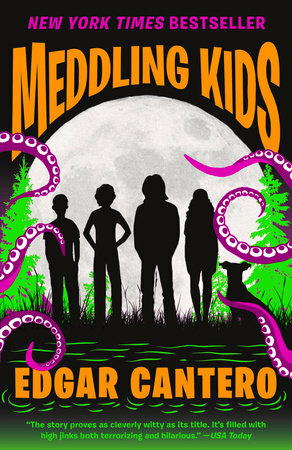 That’s probably why we picked up Meddling Kids by Edgar Cantero. The gang faced dangers in their childhood all the time. But what does that do to a person when the mystery is over and all the villains are unmasked? The Scooby Gang will eternally be teenagers/young adults their entire existence. What would happen if they grew up? Or worse, grew apart? Meddling Kids takes a shot at answering these questions. The style of the book can throw people for a loop. Stick with it. We promise the story is well worth it. The Blyton Summer Detective Club closed their last case 13 years ago; the Sleepy Lake Monster. Now all adults, the previous detectives are leading broken lives. Andy, the tom boy, has been a wanderer and recently broke out of prison. Kerri, the smart one, has dropped out of school and become an alcoholic to keep her night terrors at bay. Even her weimaraner, Tim, can’t ease her fear. Nate, the youngest, is constantly checking himself into mental institutions. He’s the only one who still talks to Peter, the leader. Nevermind that Peter’s already dead. Something about their last case never added up. Where did all those scratching noises come from? What was really hiding in that old mansion in the middle of the lake? Andy decides to reunite the team to solve this case for good. What happens when the villain isn’t just a monster in a mask? What happens when the mask won’t come off?